Ray is always right and I HATE it. It chafes my sensibilities. And no, I did NOT lose a bet that prompted me to write this entry. But I DID almost lose my sanity and a $2,000 lens if my "voice of reason" didn't penetrate my wall built of stubbornness and pride. I am posting this entry and divulging my idiocy to help those victimized by fraud. 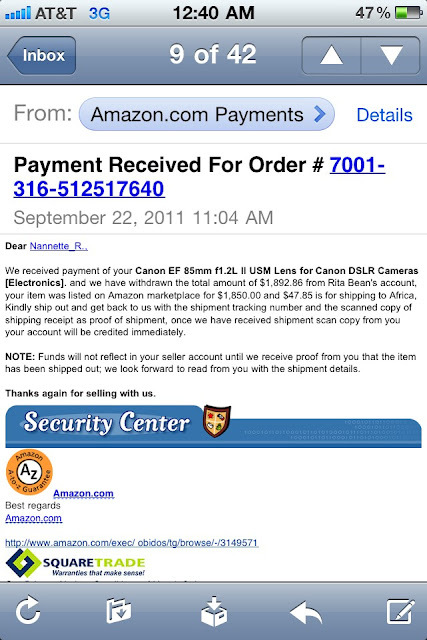 Nothing in these e-mails indicated that the transaction was bogus. When I received these e-mails I had already spent almost half a day in the emergency room waiting for my dad's test results. 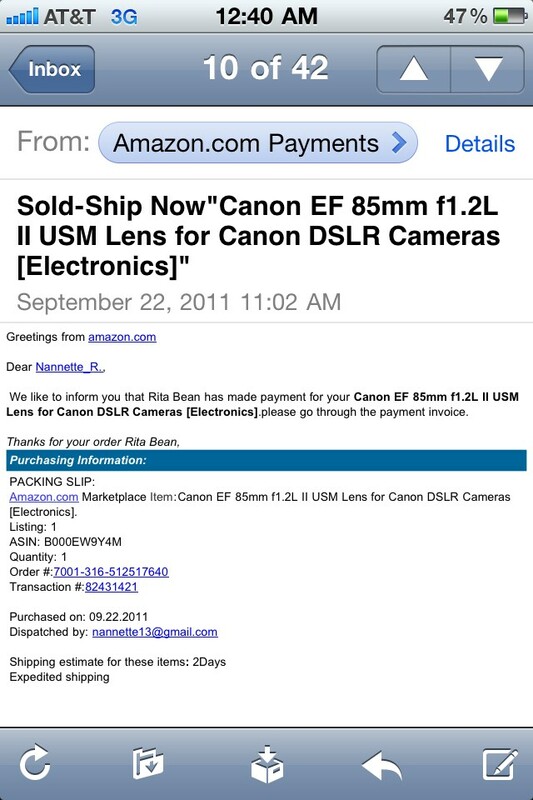 Desperation from selling my lens mingled with the frustration of healthcare that I was operating on minimal brain cells. But that is NO excuse. Ray called and texted me repeatedly with his concerns and warnings. True to form I was highly irritated and indignant with him and his lack of faith in my intelligence. "Look, I KNOW you know. But I'm just saying it doesn't sound right. Please be careful. 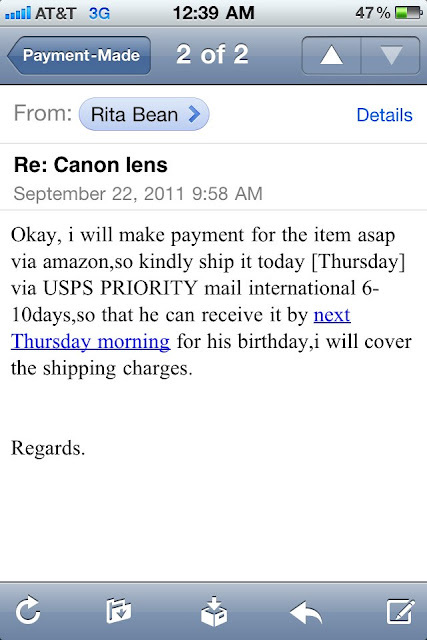 Do NOT send the lens until you make sure!" He didn't see the rolling of my eyes and the exasperated tugging of my hair as he expressed his concerns and warnings on the phone. 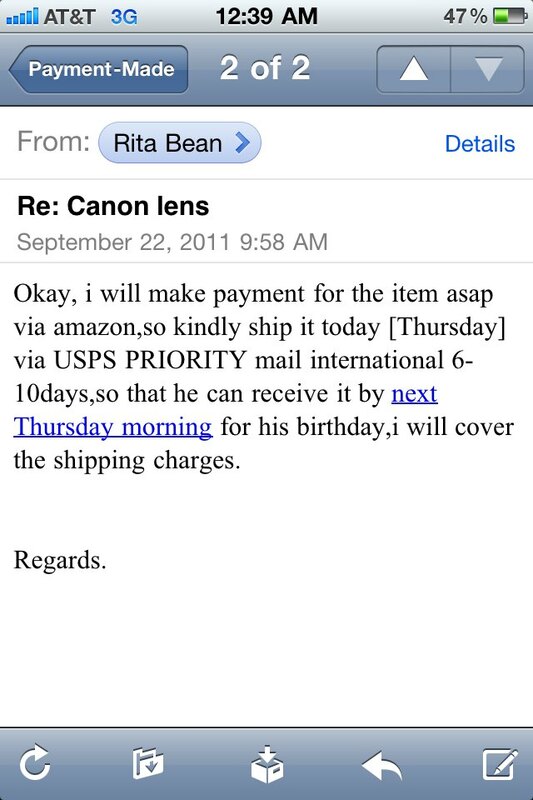 I told him that the e-mails looked legit and that I'd have to get my lens packaged by the end of the day to send to Nigeria. "...please listen to me. I know u know everything. Please triple check. Nigeria is the country that most of the mail fraud originates. 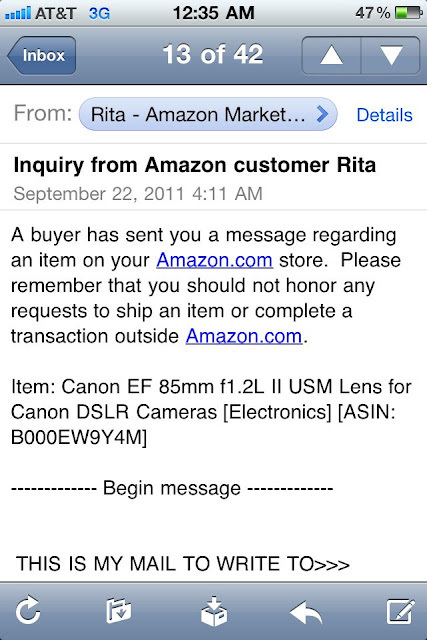 Can u at least call Amazon to get a verbal? Get Verbal. Sounds like a scam to me. Love you!" Amazon does NOT deliver to Nigeria. 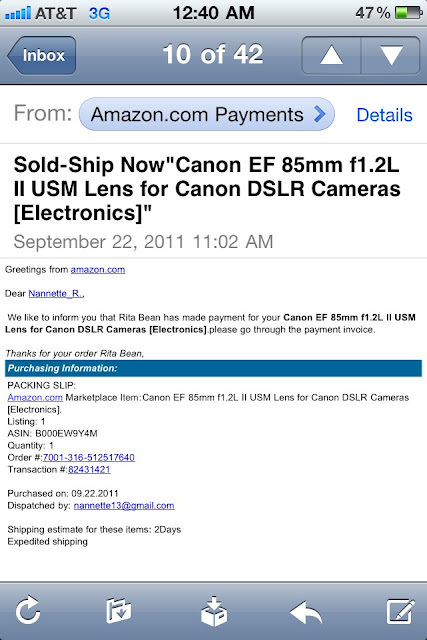 Amazon order #s do NOT begin with "7001". Nannette IS a stubborn a$$ fool! 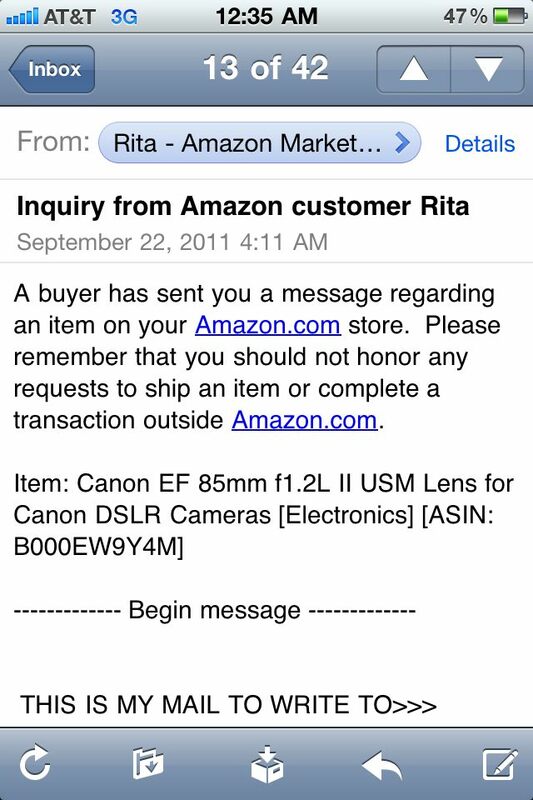 I promptly reported this incident to Amazon and never responded to the additional e-mails I received today from this "Rita Bean" who was requesting a tracking number because payment has been made. It sickens me to know that I was so desperate for the extra money that it overrode my common sense. Why did it have to take my boyfriend to knock me upside my head? I know most of you possess an abundance of common sense, street smarts, and functioning brain cells but I urge you not to emulate MY loss of intelligence. Beware, be careful, and be vigilant on the internet.